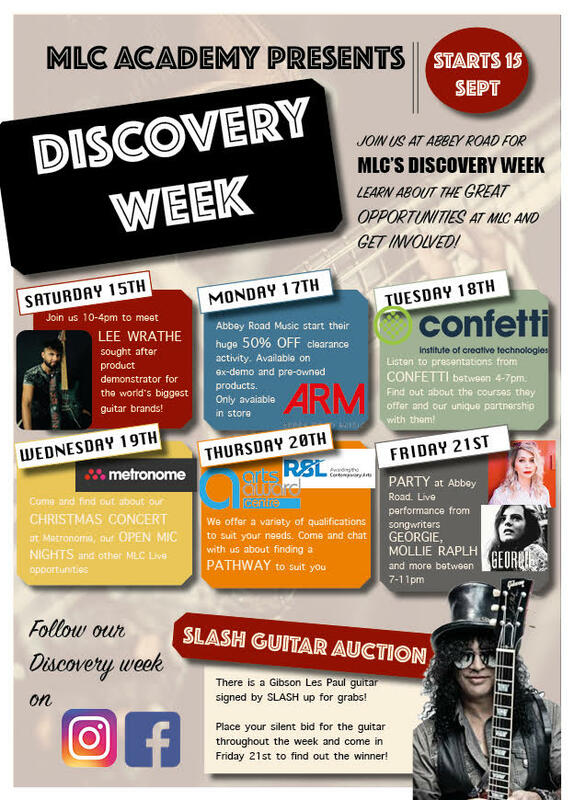 Discovery Week has been designed to showcase MLC Academy, one of Nottingham’s leading music schools. The week is for existing and prospective students alike. Come along and discover MLC Academy and what it has to offer you. Saturday 15th Sept – Ibanez and Laney brand ambassador, Lee Wrathe will give several performances. Tuesday 18th Sept – Confetti Institute of Creative Technologies presentation. Learn about the new and exciting strategic partnership between Confetti and MLC. Wednesday 19th Sept – Christmas concert sign up. Fancy performing at our Christmas concert at Metronome in Nottingham? Come along and learn more. Thursday 20th Sept – Opportunities and Qualifications. Ask us about our new courses and qualifications. Get a copy of our prospectus and create your own pathway. Friday 21st Sept – Live performances and a social. Further details can be found on the poster. Don’t miss out. We are looking forward to seeing you!